Among the documents that I recently deposited at the Friends Historical Library was this petition to Middletown and Wrightstown Monthly Meetings for permission to meet for worship as an indulged meeting, which is simply a group that meets to worship but doesn’t conduct any business on its own. This meeting would eventually become Newtown Friends Meeting. In 1815 they began meeting in the county courthouse, which had been abandoned after the county seat moved to Doylestown in 1812. In 1817, they built their own meetinghouse. Interestingly, some of their funding for the construction came from the sale of liquor. Joseph Jenks contributed $100 that he made by distilling apple whiskey, and others reportedly did as well. 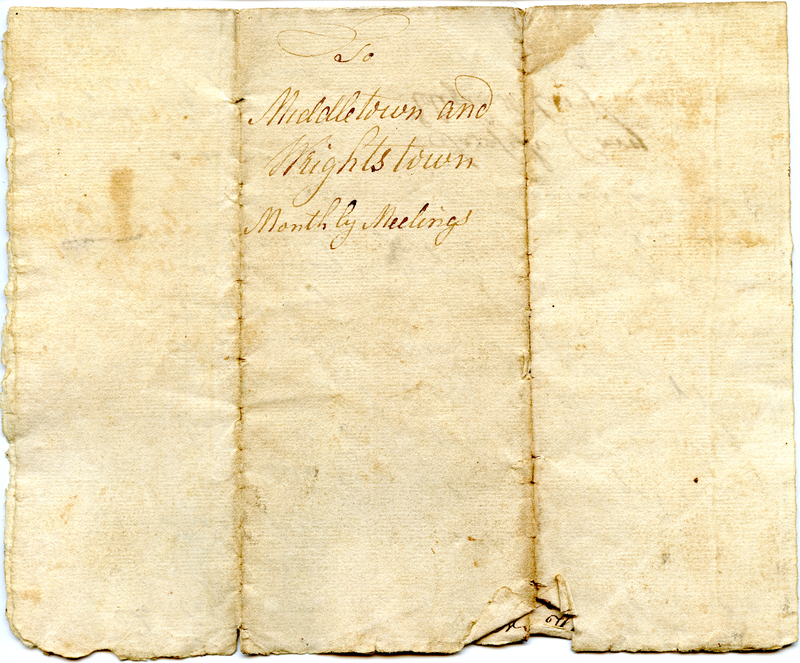 This document appears to have been written by Edward Hicks. 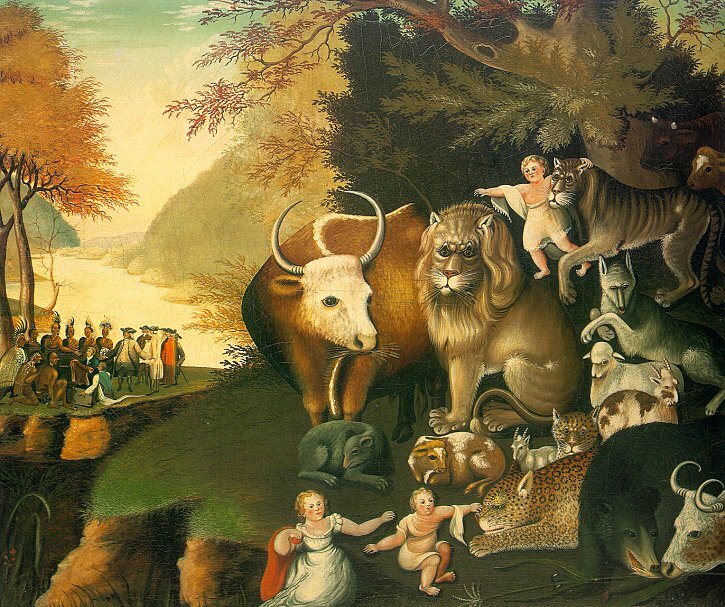 Today Hicks is remembered as a famous painter, best known for his work The Peaceable Kingdom. During his lifetime, however, he was better known as a preacher. In fact, he faced criticism from fellow Quakers for creating decorative art. He even gave up artwork and tried to subsist by farming and only utilitarian painting, but couldn’t make a living doing so and eventually returned to his art. 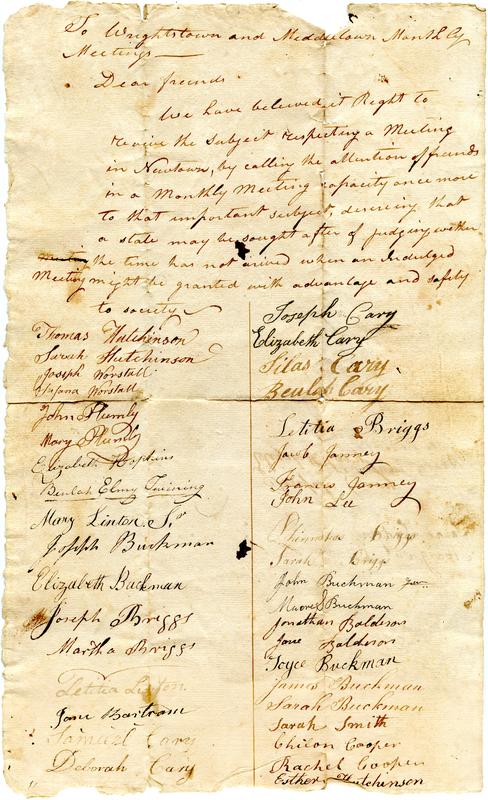 Hicks was the last to sign the petition, and the certain characteristics of his handwriting seem to match the text of the petition. 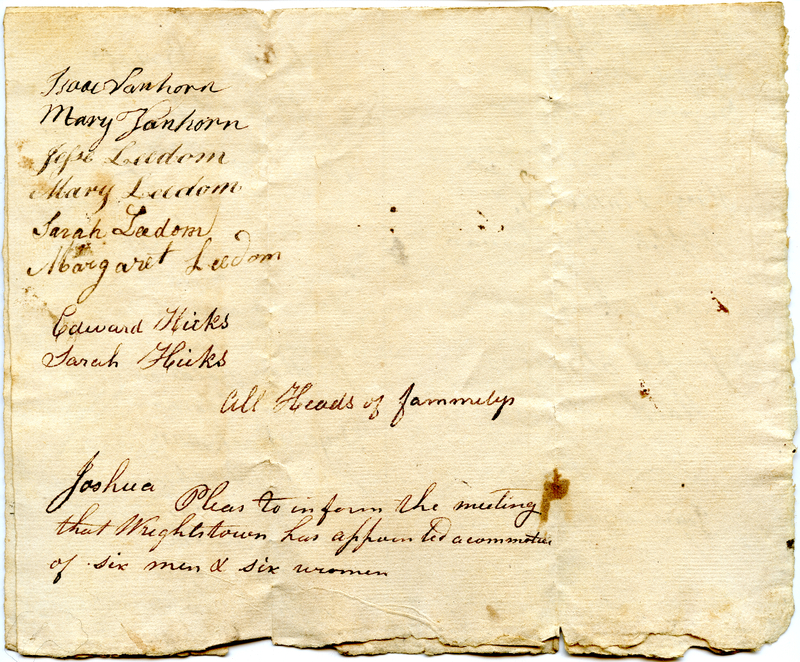 The “H” in “All Heads of fammilys” following the signatures is identical, a number of the i’s are not dotted in the letter, as in his signature, and the nearly vertical c’s match as well. Hicks’ authorship also fits with what we know about the early history of the Meeting. Hicks was a prominent member of the meeting, and he was the first preacher to speak at courthouse in 1815 as well as the new meetinghouse in 1817. Edward Hicks’ grave, with the low headstone preferred by Friends, may be found near the sycamore tree across from the front porch of the meeting house that he loved so much. While the document is undated it clearly predates 1815, the year in which Friends began meeting in the former county courthouse. It is addressed to both Middletown and Wrightstown Monthly Meetings because Newtown drew members from both. We have believed it Right to revive the subject respecting a Meeting in Newtown, by calling the attention of friends in a Monthly Meeting capacity once more to that important subject, desiring that a [state?] may be sought after of judging wether [sic] the time has not arived [sic] when an Indulged Meeting might be granted might be granted with advantage and safety. Interestingly, both men and women were listed as heads of families. However, it appears that the names of each couple were written by the same hand, so perhaps the husband signed both names. They seem to have gotten a positive response from Wrightstown Meeting, which appointed a committee of six men and six women to look into the matter.